Have you ever wondered why on some days the sky is its normal blue color with perhaps a few puffy clouds billowing by, while on others the sky is covered with aerosol-looking “streamer” clouds emanating from airplanes, criss-crossing back and forth as they suffocate the atmosphere in a blanket of white? Many people call this latter phenomenon “chemtrails,” and an eye-opening video recently published to REAL.video shows how these chemtrail operations appear to be spraying so-called “living fibers,” which are showing up on landscapes, crop fields, and even around people’s homes. 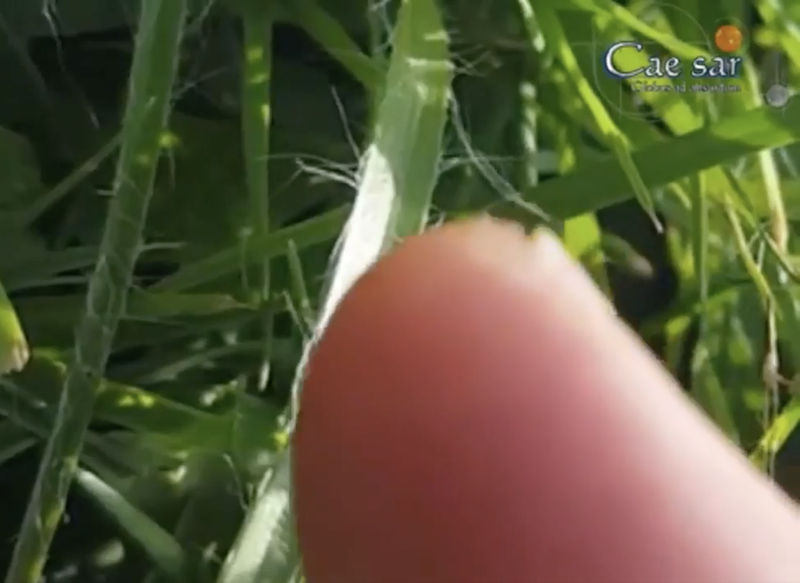 The Truth Patriot channel has uploaded footage of what appear to be tiny living fiber threads on blades of grass that, as the grass remains still, these fibers wisp around as if they’re alive. There’s also footage of tiny particles being blasted down from the sky on an otherwise clear day, the individual filming them pointing out how they seem to be coming from nowhere. “We face a threat with these chemtrail fibers, and not many people notice them,” explains Truth Patriot as he examines footage captured in Germany, and tries to figure out what’s taking place. While interviewing a guest about his perspective on what the living fibers in the grass are made of, Truth Patriot is told that they appear to have some kind of life of their own. “They are somehow moving to the light of the sun, and also to the finger here,” he adds about how the fibers appear to move when in proximity of human skin. Truth Patriot says he was able to speak to the person who captured the footage in Germany, and she apparently revealed that she, too, saw the “lifelike” nature of the fibers as they pored around in the grass to see how they behaved. There are many alleged reasons for the spraying of these particulates, among them being chemical weapons used for depopulation purposes. While the government now claims that it’s all about “geoengineering” to protect against “global warming” and “climate change,” this excuse doesn’t seem to pass the smell test in terms of being valid or legitimate. Living fibers, after all, would seem to have nothing whatsoever to do with helping the climate, and everything to do with waging chemical and biological warfare on perhaps the food supply, as well as people and their families. “They seem to like LED light … and microfibers and clothing of unnatural types,” says Truth Patriot about the living fibers. Quantum Fields: The Real Building Blocks of the Universe?